From one of the key members of the hit Grey's Anatomy TV series, Executive Producer Mark Gordon, comes the latest TV hit for fans of TV drama. 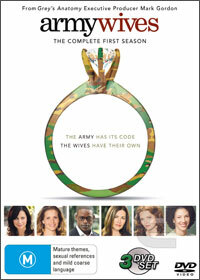 Unlike the aforementioned series, Army Wives revolves around a "group" of women and a man whose partners are away at war, training or have anything to do with the American military. The series deals with a variety of topics from relationships to family and the honor of being enlisted in the army. The stars of the series however are Kim Delaney, Catherine Bell and Sally Pressman who really give great performances as these women caught between their husband's duty towards the country and their duty towards them. The main storylines include the relationship between Roxie and Trevor, Michael and Claudia's difficulty of working and living in the same place, the troubled marriage of Roland and Joan and the controversial story of Denise and her teenage son. It's a series that most will enjoy, especially female viewers, however at the end of the day, it's also quite forgetable and really doesn't add anything new or enlightening to the genre. Presented in 16:9 widescreen, the video quality is quite impressive with sharp images and a vibrant colour palette that is equally complimented by the Dolby Digital 5.1 surround sound. Army Wives also features the best extras for a TV series that I have seen in a long time that include outtakes, bloopers and some great documentaries. Definitely a must have for TV drama fans!